We were up before sunrise in order to find and photograph a herd of semi-wild Camargue horses in that sweet early morning light on a ranch that’s part of the Nature Reserve. The horses are owned by specific ranches but they live free on vast expanses of land. There are fences and some will be bred for riding but many will never be shoed or ridden in their lifetime. The herd we found has many foals born in the last few months. 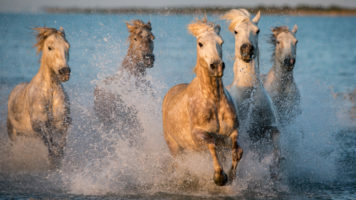 Camargue horses are born brown but turn white when they are about 3 years old. They were very curious and most of us had to watch our backs and gear as the mares and the little ones came over to check us out. What an amazing first experience with these beautiful creatures. I’ve even included some of our guests’ images. It’s so great to see that in the same environment, we all have our own unique vision. The other two animals the Camargue is known for are long-horned bulls and flamingos and we got time with both. Right after our photoshoot in the morning, we watched the ‘cowboys’ known as “Gardiens” corral a herd of bulls before heading back to our hotel. We then had an amazing lunch in Arles at La Table du Caviste and visited the old Roman Arena. The history in these old towns is amazing! After some downtime in the afternoon, we headed back out in search of flamingos as the sun was setting. What an amazing day but Day 4, with our 2 sessions at sunrise and sunset photographing the horses running through water, would prove to be even more exciting! 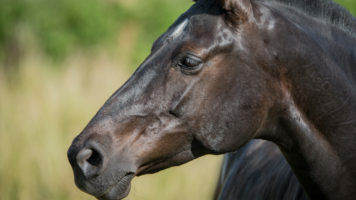 Beautiful horse portrait by Tammy Beveridge. Our chef. Photo by: Tammy Beveridge. Flamingos in the Camargue. Photo by: Vanessa Dewson.